1989 sadly marked the beginning of a commercial and creative nadir for both The Fantastic Four and Marvel in general, a downward trend that would eventually see Volume One of the FF discontinued. While the company’s fortunes had risen and fallen throughout its late 80s ownership by New World, its acquirement by MacAndrews & Forbes saw a greater attention paid towards Marvel as a commercial commodity rather than a creative environment. Part of the offshoot of this was that seven of the most popular Marvel talents (Erik Larsen, Jim Lee, Rob Liefeld, Todd McFarlane, Whilce Portacio, Marc Silvestri, and Jim Valentino) became dissatisfied and created their own very successful comics label, Image. With most of the rights on Marvel characters being strangled by red tape, the blockbusters that vastly upturned the company’s fortune in the 21st century were then impossible, and the misjudged acquirement of other subsidiaries (including an underachieving sticker company and a flop Marvel restaurant chain) meant that Marvel was in severe financial difficulties.With an eye on the collectors market (a market which soon rebelled against obvious exploitation and saw the bottom drop out of Marvel’s sales in 1995) cross-referencing issues and gimmicky covers became a norm, genuine creativity cut back to save profits. It’s a depressing read, with two issues of the 1989 run tied in to "Inferno" and the summer annual given over to an "Atlantis Attacks" storyline that spread across fourteen separate Marvel annuals. At $2 each, it was a shameless commercial venture that would see readers have to part with $28 to read the entire narrative. The full factual story of the decline of Marvel – shares were worth $34 in 1993, plummeting to just over a dollar in 1996 – can be read in Comic Wars: Marvel’s Battle For Survival by Dan Raviv. A disheartening tale of squandered investments, overreaching bank loans and stock market squabbling that eventually led Marvel into bankruptcy from 1996-1998, it’s extraordinary the games that were being played behind the scenes of the group at that time. However, this site’s main objective is a critical history of the fictional side of The Fantastic Four, and this aspect was indeed taking a massive slump in terms of fresh ideas.The 1980s were a good time to be a reader of the Fantastic Four. With the 70s having irregular purple patches amongst the lacklustre periods, then the 80s were the best time to read the comic since Stan and Jack left. There were dour bits, sure – Roger Stern’s issues could be a little flat, and Doug Moench was miscast in the role of writer, but with John Byrne giving the book direction and Steve Englehart ably taking on the mantle it was generally a fine period. The book had been given a realistic development… no longer were Ben and Johnny perpetually overgrown boys, they’d aged and matured with the original readership.Sadly, this was put on hold for 1989. While the ’88 run was no classic, Marvel’s insistence that Reed and Sue rejoin the team meant that Englehart felt creatively neutered, and reacted against it. The first four months saw him try to give a dignified end to his sidelined "Mantis" character (for two issues under the pseudonym "S.F.X. Englehart"), while from May-November he worked under a new name in protest against his paymasters, over four years before Prince would decide on a similar course of action. The work of "John Harkness" is a dreadful end to the decade, a lifeless, hack-written dross where the team and their enemies spend their time throwing witless puns at one another. Like a Roger Moore James Bond movie, every single scrap of dialogue is a listless retort and response. Probably the most inept is the Torch’s dig at Hydro-Man: "Are you water or wine, Hy--? –‘Cause you sure talk like you’re drunk!" While the illustrations were competent if undramatic (Rich Buckler took over from August, but was still inked to mediocrity thanks to Tanghal), the storylines, particularly the dialogue, were appalling, a mire of unimaginative, self-congratulatory lines and exposition. Rarely had the FF felt as flat and wholly complacent as this. 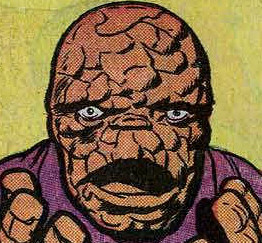 The first Harkness story saw the return of Ben Grimm, which is quite notable given that he was believed dead (The Thing #23), though it was no less than the twenty-first time that Ben changing back to his human self had happened in the title. (Count ‘em!) Slightly less were the Frightful Four, here making their tenth appearance if you count them as puppets from #100. One thing I’ve never been keen on with later Frightful Fours is having a fourth member that has the power alone to challenge the team. Given that Klaw has fought the FF to a standstill before, then shouldn’t he be able to totally defeat them as part of arguably the most powerful FF ever? For the ’89 team then gone was the Sandman (who had turned his back on crime in the Spider-Man comics), to be replaced by Hydro-Man. The Wizard remained, albeit completely emasculated, and the Trapster was no longer around, to be replaced by the super-strengthed Titania from the Secret Wars series. In order to understand fully the Harkness scripts it’s necessary to understand Englehart’s mindset when he was writing them. With his successful Silver Surfer series taken away from him (the Lee-Buscema series, while brilliant, wasn’t a hit book), and the West Coast Avengers frequently edited without compassion, Englehart had become increasingly bitter at how he was treated. 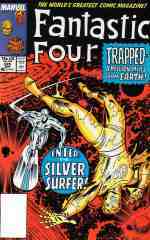 When faced with having to bring back the "old" FF, he had the group placed into suspended animation, while bland clones recreated their adventures. Marvel were apparently so delighted with what Englehart called his "1962 FF" that they even wanted them in their own mini-series. As for the stories the writer really wanted to tell, he opted for a series of three "dream" issues. With the FF effectively taken out of the book for four months, then reading these issues at the time convinced this reader that things would never get back to normal, and the book just didn’t "feel" right. Yet looked back upon with the benefit of hindsight, some of the dream issues are superficially entertaining, and the cloned Fanastic Four – whose dialogue is 50% paraphrasing of Stan Lee dialogue, 50% bitter digs at editorial (1962 Reed: "There’ll be no more nagging doubts… no more questions! Once we complete this adventure, the past will be gone -- -- and the new era will be officially begun!”) are entertaining. With Johnny instructing Sue to become invisible for no reason, and Ben uttering “Bah!” a dozen times, it’s a fascinating insight into how a creative relationship can break down on paper. The Doom-Kristoff issue also isn’t bad, made even more like a dreamscape by four of the pages being misprinted in reversed colours. #332, featuring a cat fight between Crystal and Sue is… interesting. The same issue features a dream version of #245, where Franklin was aged to manhood and fought the FF. In the dream take of events, he had secretly used his powers to make Alicia fall in love with Johnny… which is a far better resolution of the Ben/Johnny/Alicia set-up than the one we were eventually given in 1991. For more of Steve's feelings regarding Marvel, and why he chose to write under a psuedonym, then please see the frank interview he gave to this site. It wasn’t just the Fantastic Four who suffered during this period - many of Marvel’s other creations eventually underwent unpopular formats, including a commercially successful yet critically despised "Peter Parker Clone" plot for Spider-Man (1994-1996). However, while the same period on the FF’s title would see it using gimmick covers to boost sales and eventually be cancelled, it did have one brief salvation from 1989-1991: a genuine original in the form of Walt Simonson. After 19 issues and one annual, Simonson eventually went the same way as Englehart-Harkness: out of the company and vowing never to work for them again. But for the first time the title had more than 12 issues in a year, meaning that while "John Harkness" got to wrap up events in "Mid-November", Simonson debuted on the title for December and "Mid-December". His first story, a trilogy about Congress trying to get superheroes (and villains) to register isn’t his best, being overlong and with the humour too overstated. However, it’s nicely political and does show a fresh handle on the writing duties, to say nothing of the fact that it went on to inspire later, similar plots in Marvel titles. But Simonson’s real start of brilliance would be the following year, where he would also begin his own pencils and inks. Final trivia? #330 has a shot of the cloned Fantastic Four attacking Psycho Man, who was believed to be irrevocably defeated at the end of the Sue-Malice story arc from 1985. (Along similar lines, Simonson's witty resistance to editorial's cross-title plan to have villains from different titles take on each other - by giving the FF the really lame villains to fight - saw the recently captured Hydro-Man as part of the set) Speaking of John Byrne, there’s also a gag about him being obsessed with the She-Hulk in #328. Byrne had recently returned from DC to work on The West Coast Avengers but it’s not known how lightly the joke was meant. While we can assume it was a throwaway gag, when I mentioned it on John’s very own site the post was deleted overnight…On the subject of in-jokes, look out for Walt Simonson’s first issue where Ben and Sharon have been to see the Batman movie. Although I’m sure it wasn’t intended, another factor contributing to Steve Englehart’s stress at the time was having to battle to get his credit in the movie. Finally, after earlier talking about "collars and cuffs", Johnny again finds himself aesthetically changed from June until the end of the year, though Sue, bizarrely, does not. Refreshingly, the title once again becomes self-contained (albeit too self-contained) and no real cross-referencing is required. All, that is, except for the Annual, which is the conclusion to the stories in thirteen other annuals. Due to the quality of the main feature and the extortionate way in which it was presented, I’ll display no "required reading" for that particular title. As for the rest of the year, then Graviton was last seen in West Coast Avengers #13, and there’s Ben referring to when he almost joined The Avengers (West Coast Avengers #9). There’s Kang referring to one of the council of Kangs and their recent activities (The Avengers #295-#300) and his first meeting with Ben and Johnny (Strange Tales #134, ***). There’s also Necrodamus referencing his prior exploits in Defenders #1 and The Avengers #128 and the trial of the Watcher from Captain Marvel #34. Finally, Thor’s guest appearance in #334 is noted as being before his appearance in #411 of his own title, and Captain America refers to events from The Avengers #311 in the same issue.